Knysna Backpackers @ Edge of Africa Lodge offers superior backpacker accommodation with fresh linen and serviced rooms, modern bathrooms and comfortable seating areas. This century-old Victorian House (a listed national monument) is the oldest existing backpackers lodge in Knysna and is perfectly situated on a slope, overlooking the Knysna Lagoon. A place where you can put your feet up and admire the view or take a two-minute stroll to town and explore Knysna. 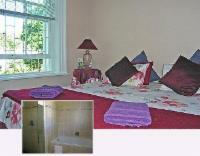 As well as backpacker accommodation, we also offer Private Double en-suite, Standard Private Doubles and Dorms. Rooms are basic but comfortable, each with beautiful high ceilings and original yellow-wood flooring. Facilities include: BBQ facility in garden; free Wi-Fi; communal lounge with TV; complimentary tea/coffee and morning snack; book exchange; clean bathrooms; a covered patio area with lots of activity information and flyers. Lovely old house with perfect location, quiet street just around the corner from anything you would want. Shops, restaurants, waterfront etc. Very helpful and approachable staff, especially Jason ;) The main bathroom's window was locked so it did get a little stuffy at times, but that's honestly my biggest complaint. Knysna Backpackers @ Edge Of Africa Lodge is 0.4km from the centre of Knysna Central , the nearest airport 74.5km (George Airport).